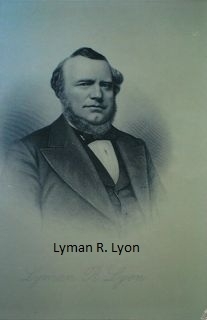 Lyons Falls, originally known as High Falls, became known as Lyon(later Lyons) Falls in honor of the Caleb Lyon family. Caleb Lyon, acting as land agent for John Greig, his wife Maria Dupont and six children, arrived here in 1819, (their youngest child, Caleb, Jr. was born in 1822). 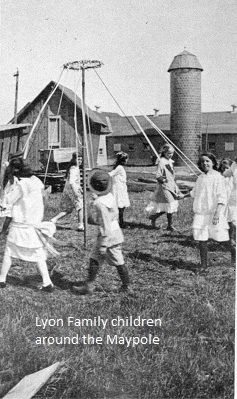 He built his home, mills, and a bridge across the Moose River, and founded the settlement called Lyonsdale. Caleb was instrumental in attracting many settlers to the area and purchased 10,000+ acres for himself. He died Sep.15, 1835, in the woods near Lyons Falls. A memorial plaque was placed near the spot he died, and it can be seen today from the River Road. He was buried on an island at Lyonsdale and a large monument was erected. However, his son, Caleb,Jr., always at odds with his brother Lyman, had his body secretly removed and interred in Greenwood Cemetery, in New York City. Caleb,Jr. became a well known national figure and in1864 President Lincoln appointed him governor of Idaho. 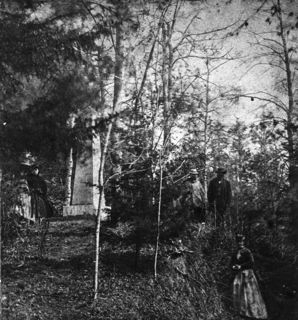 In 1839 Caleb,Sr. 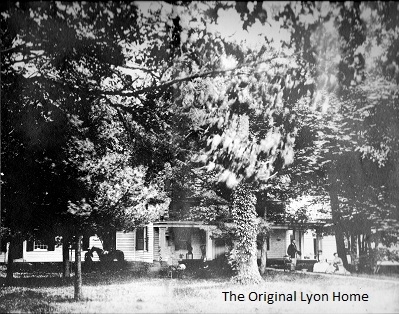 's oldest son, Lyman Rasselas married Mary Brinsmade Northrup and built a large clapboard house just north of Lyons Falls. 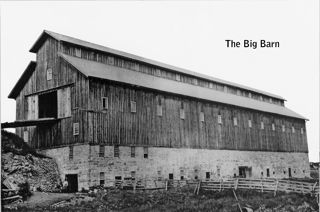 By 1862 he had built a splendid stone mansion and maintained a large dairy farm for which he built the renown "Big Barn." 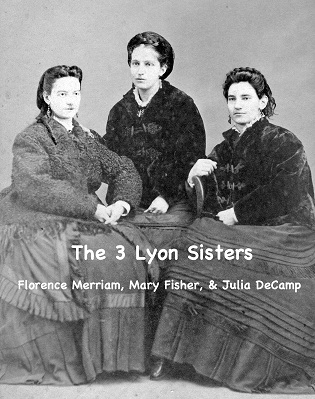 Lyman and Mary had three daughters: Mary Lyon Fisher, Julia Lyon deCamp, and Florence Lyon Merriam. 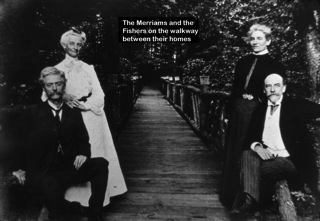 Lyman was active in public affairs, one of the largest land owners in the state, owned the water power of the High Falls and worked diligently for the construction of the Black River Canal. He died in 1869 in Georgia where he had gone for his health. 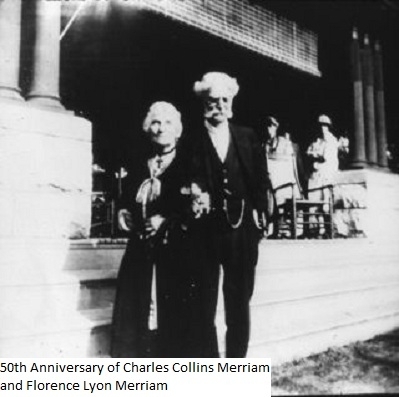 In 1876 his daughter Florence Isabella married Charles Collins Merriam and they lived in the Lyon Mansion until it burned in 1886. 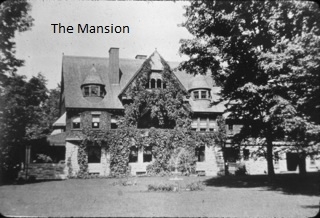 Florence then had a new home constructed which she named "Florissant", this remains in use today as an occasional bed and breakfast and is known as "The Mansion." Caleb, Sr.'s eldest child Laura Eliza married Francis Seger, who was also a large land owner and an active participant in public affairs. 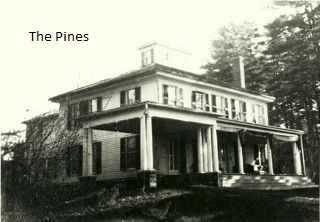 About 1830 they built their home over looking the falls and named it "The Pines." This lovely home is still occupied today as a private residence. 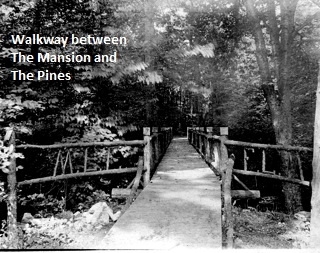 The Pines and The Mansion are connected by a wooden walkway. 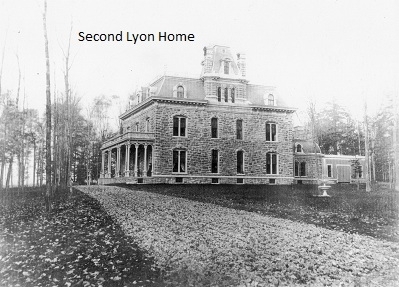 This was built on the orders of Florence Lyon Merriam and Mary Lyon Fisher so the sisters could visit the other's home more easily. Considering the influence the Lyon family had on the development of the area it was indeed appropriate that the name High Falls was changed to Lyons Falls.